Same set of polishes, different angles. Grouped by color. I'll be announcing the winners shortly, if they wish to be announced. This has to be the easiest one I will ever do, and probably the last. All you have to do is guess how many nail polishes I have. Check the photo and leave a comment with the number. 3 winners will be chosen. 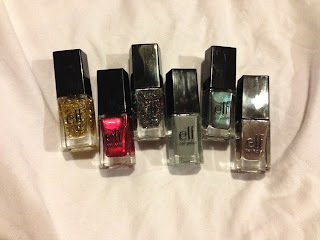 Prize: set of E.L.F mini polishes. Ends Tues, Oct 1st at Midnight (EST). Winner will be chosen and announced on Oct 2nd. US residents only! Yes. Coming soon. I am thinking about doing another giveaway, but I may do it a little different. I know some people have issues taking clothes/shoes/etc from other people, regardless if its brand new or not. I personally have no shame. If its free and I like it, why not? I've gone to thrift stores before and don't mind it. Anyway.. I want to giveaway some of my shoes/accessories that I've had for a bit and don't wear. Since my barrage of ankle and foot injuries, I (sadly) can't wear any of my heels anymore ::cue violins:: Many of them are *BRAND* spanking new, just without the boxes. I feel weird about putting my club/freakum heels in the donation boxes, or dropping them off at Salvation Army. So this is where you guys come in. I want to do a shoe giveaway (only the new, never worn shoes of course) and in turn, I want to see the winners do an OOTD post via IG or Twitter, so I can see my babies in action. Not 100% sure how this is going to work out, but its an idea. Most of them will be size 8.5 - 9 and probably 3" and up. You all have given me great feedback for my blog and it's great to see that I've got dedicated readers! 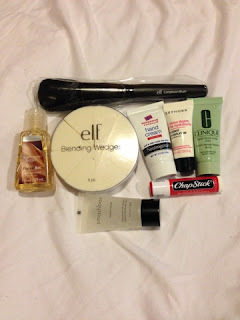 Thank you for making my first giveaway a success! There definitely will be more in the future! Let the giveaway begin! There will be 3 winners, each getting a makeup bag with cool beauty items. There will be 2 winners that receive a makeup bag with ELF mini nail polishes, and a 3rd winner will receive a makeup bag with deluxe samples of cosmetic products, a full size ELF Studio complexion brush, and ELF blending wedges. One of the three lucky winners will receive a *mystery* gift with their gift bag :-) enter to win and find out! DISCLAIMER: This giveaway is not sponsored by ELF or its affiliates. I purchased these products with my own money.